How Much Money Should I Keep in the Cash Register? How Much Money Should I Keep in the Cash Drawer? Retailers who take more credit and debit card payments or checks than cash will not usually need much change on hand. But it's always wise to have a little more cash available than you think you will need. Obviously, for safety and security purposes, you don't want to have too much cash in the store. And you'll want to invest in a fire-proof safe or create a secure location to store the money at night. The question of petty cash should be addressed during the business planning stage while establishing store procedures. The amount of money a retailer should keep on hand will vary by the volume of sales, the ability to safely store the money and the type of payments the retailer receives from customers. It may take a few weeks dealing with the public before you can determine exactly how much money to have on hand and in the cash drawer. Besides the beginning amount of cash in the register, determine a maximum amount. Pulling excess money from the cash drawer during a shift, sometimes called a 'cash drop,' is good cash management that will reduce the amount of money on the sales floor. This process is especially useful during heavy sales times like the Christmas shopping season. Although it's great to have high amounts of cash rolling into your business, to be safe, it's best not to have it too visible. Examine the number and dollar amounts of bills and rolled change on hand each day to make sure your store never runs short. If you find that you are constantly running out of quarters or other coins, then consider increasing the amount of petty cash. Note that not all of the store's cash needs to be kept the register. Retailers may want to keep an additional amount of rolled coins and other cash in the safe as an in-store bank. This can be used for emergency and unforeseen situations, such as running out of paper products in the restrooms, or less pressing things like treating the staff to coffee on a busy day. Be sure to limit the access to this cash to trusted store personnel. As part of your standards, set the dollar amount of cash to be kept in the drawer. It is not necessary to worry about the types of bills or coins in the amount each night, for this practice simply control the total. Best practices for most retailers is $200 per drawer or register. This would be based on a ticket average of under $200. If your ticket average is over this amount, you only need to adjust if you have a high volume of cash business. But, the reality is, with today's mobile payment methods such as Apple Pay, the days of cash are numbered. 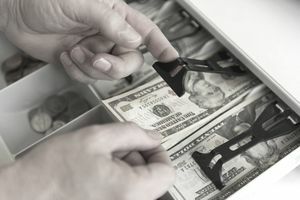 When "cutting" the drawer at night (cutting refers to pulling all of the cash over the drawer limit — $200 in our example) try and keep the bill distribution to match your desired starting point. Most retailers do not count the change for this purpose, but simply the bills. Meaning, the retailer leaves $200 in bills in the drawer and only pulls change when it's overflowing. You still need to count all of the change at night to balance the drawer. This provides a check and balance system to help deter internal theft. Each night at closing, balance the cash drawer back to the starting amount and prepare the daily deposit according to your operating procedures. Many retailers take deposits at night, but that can lead to safety concerns. The best-case scenario is to secure the money overnight in a safe and make the deposit at the bank during daylight hours. You don't want to endanger that night manager's safety by making them the potential target of a robbery. How Do Your Get A Store Ready for a Power Outage? What are Vendor Co-op Funds?